Generally speaking, the best things ever. That's all. 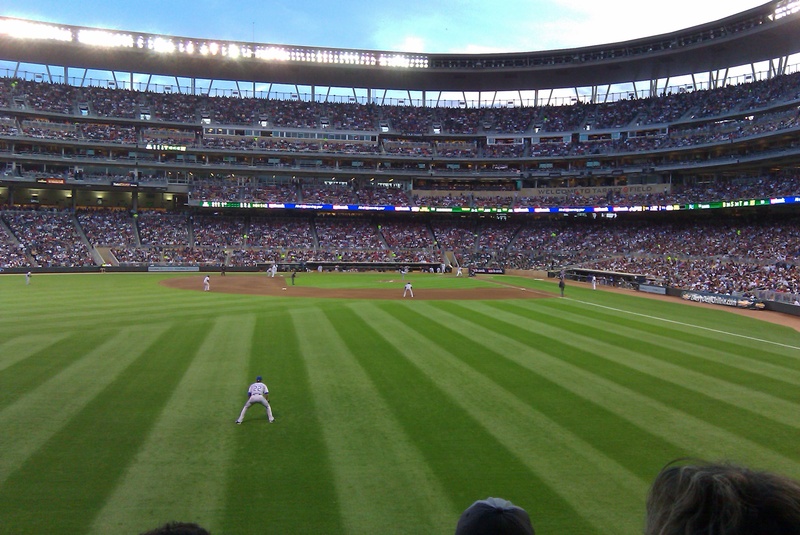 Last night, I ventured into the wilds of Minneapolis to experience outdoor big league baseball in Minnesota. 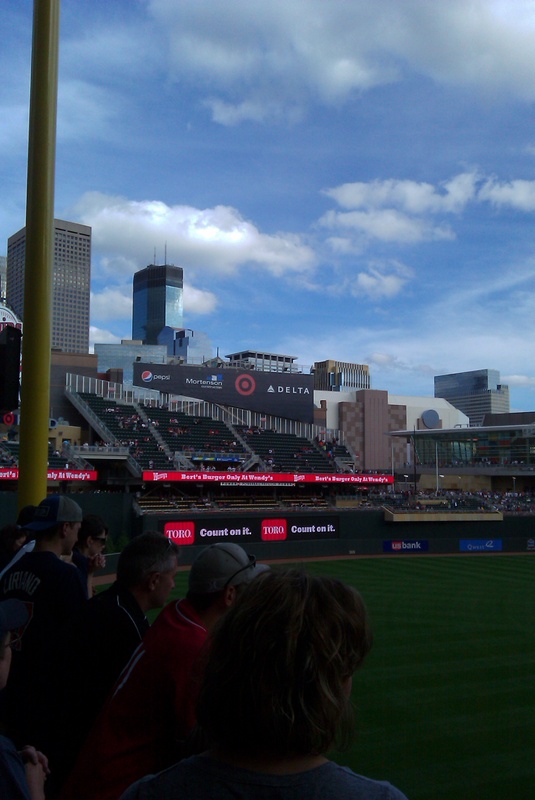 Let me start off by saying this isn’t the first time I’ve been to an outdoor game in MN, but the St. Paul Saints are not quite the same thing. 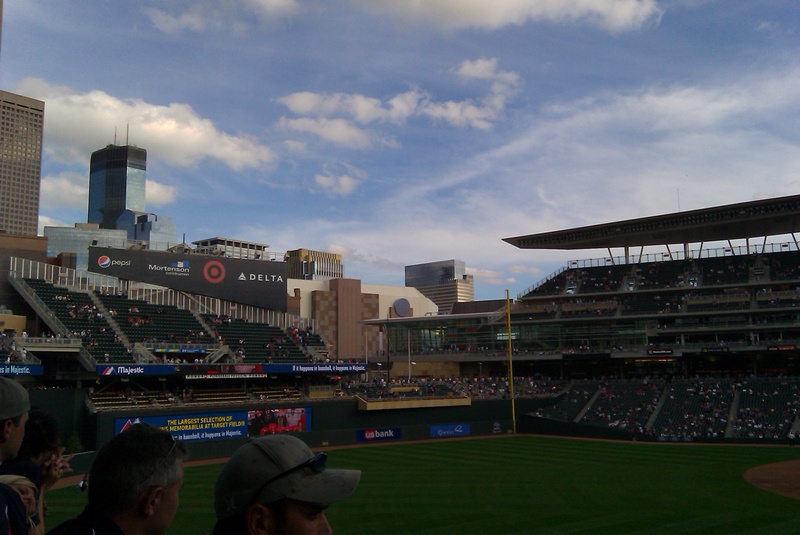 Anyway, for the first time visitor, Target Field is really something spectacular. 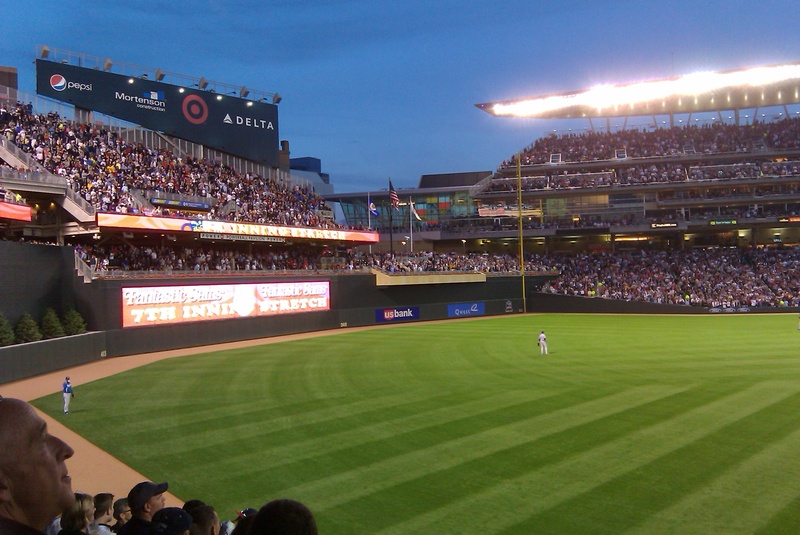 I now believe that the Twin Cities have two of the finest major league sporting venues in the country, with the Twins stadium joining the Xcel Energy Center where the Wild play. 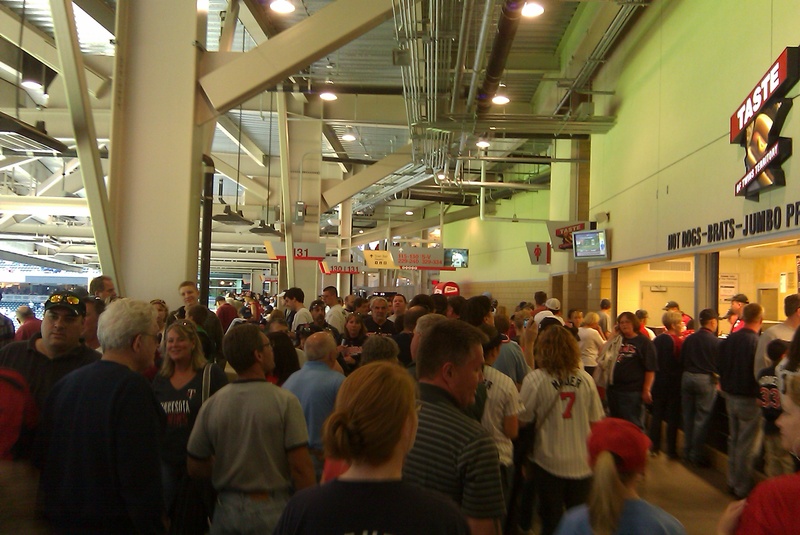 As you can see from this picture, the place was packed. I had to get tickets off of Craigslist the day of the game. 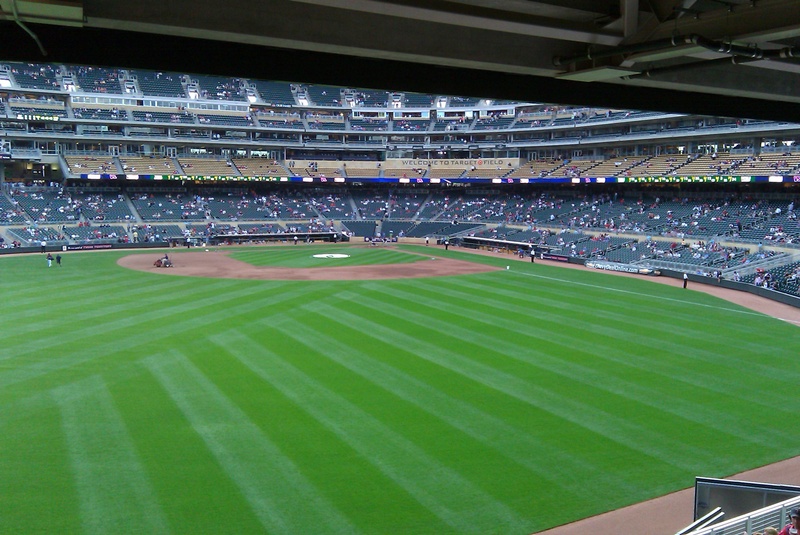 However, I chose pretty much the perfect seats for the perfect price, as you will see in a bit. Simply walking around this place is a bunch of fun. Here is the team from FSN North. 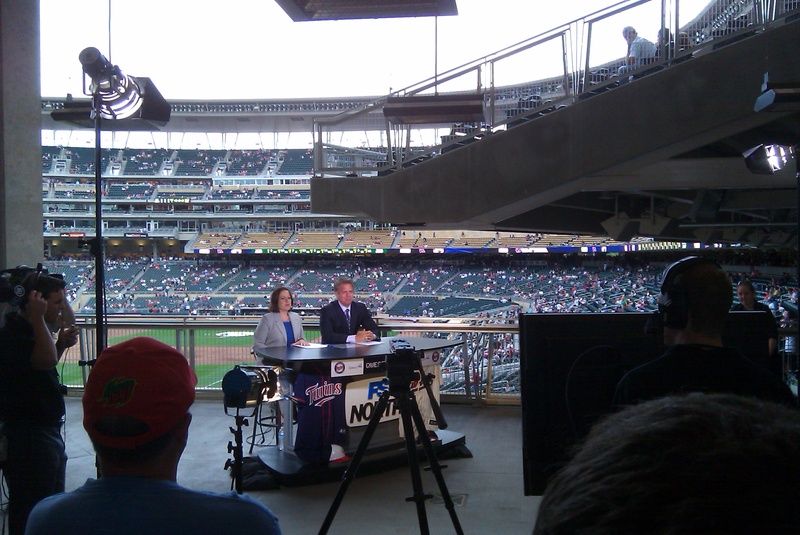 As you can see, Marney Gellner and Roy Smalley were on point to give a great Twins pregame show. Or, at least, I assume they did. I did not stick around. Too much other stuff to do. 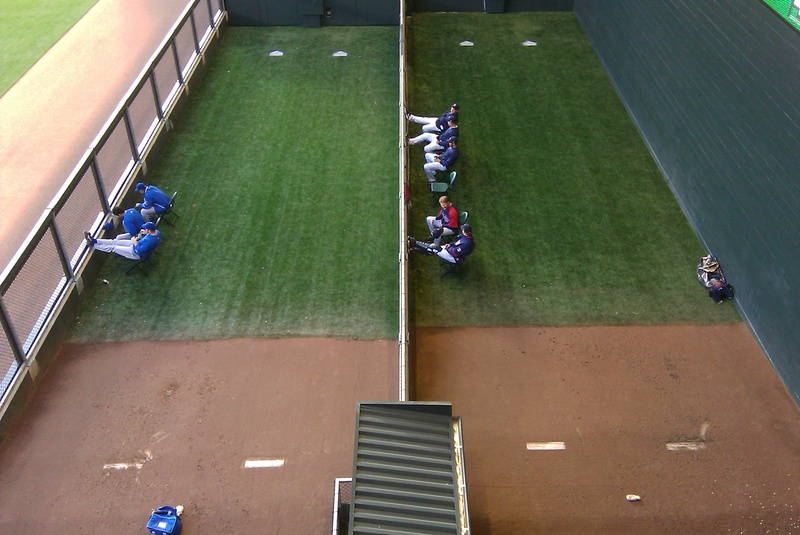 Here are some pics of the field. As you can see. It is a gorgeous thing. And here is the view from my seat. I got these off Craigslist for $20. It was one of the better purchases I have made in the last few weeks. 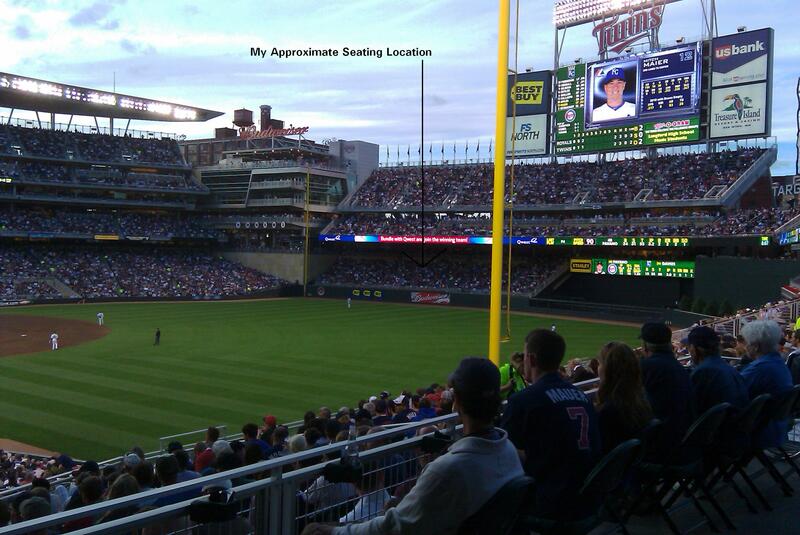 Not only are they great seats, they were less than face value for the tickets!… by a dollar. They only bad thing about sitting in this spot is that you cannot see the gigantic video board as it is directly above you, and blocked by the underside of the upper deck. Here are some pics from throughout the game as the light changed to night. 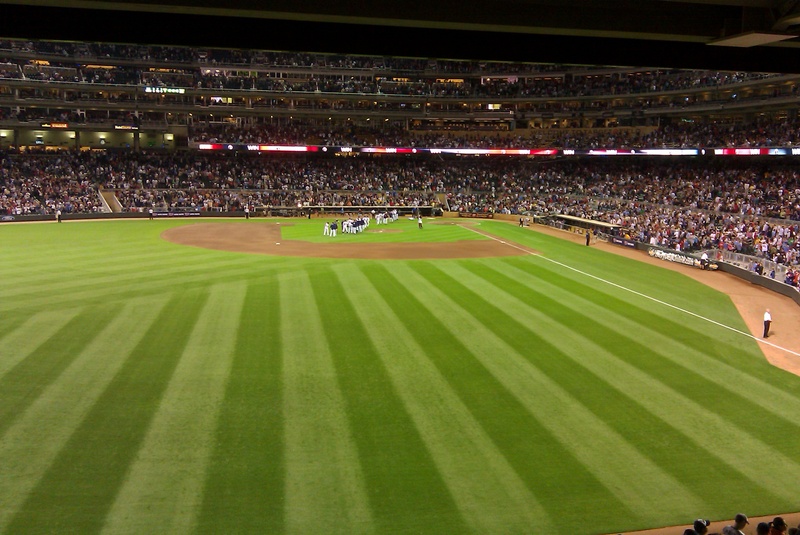 Also, with these seats, anytime someone hit the ball to left field – like when Punto hit it over Podsednik’s head, I’m pretty sure I was on TV for about a quarter of a second. However, I understand why he may have been thinking about other things, for Christ’s sake, have you seen his wife ?!!? And now, onto the food and drinks. 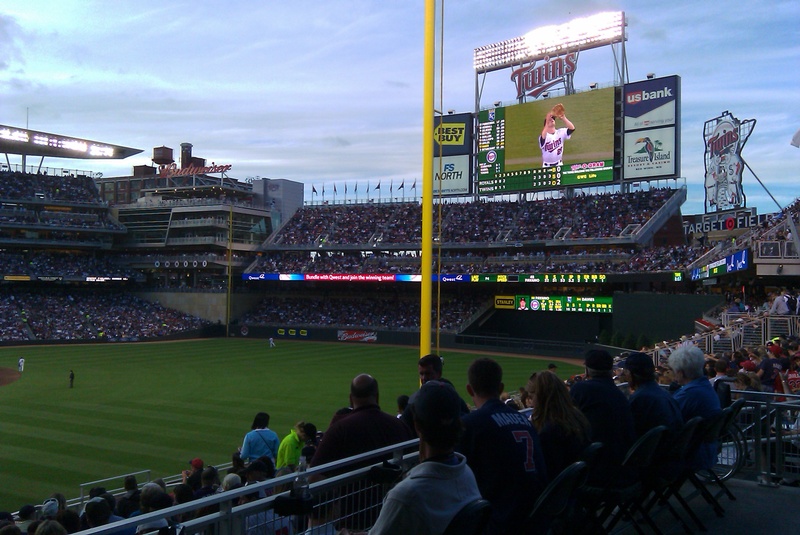 Let’s face it, ballpark food is spendy. It becomes even more spendy when you throw in getting something to drink (which is why I never, ever get anything to drink). 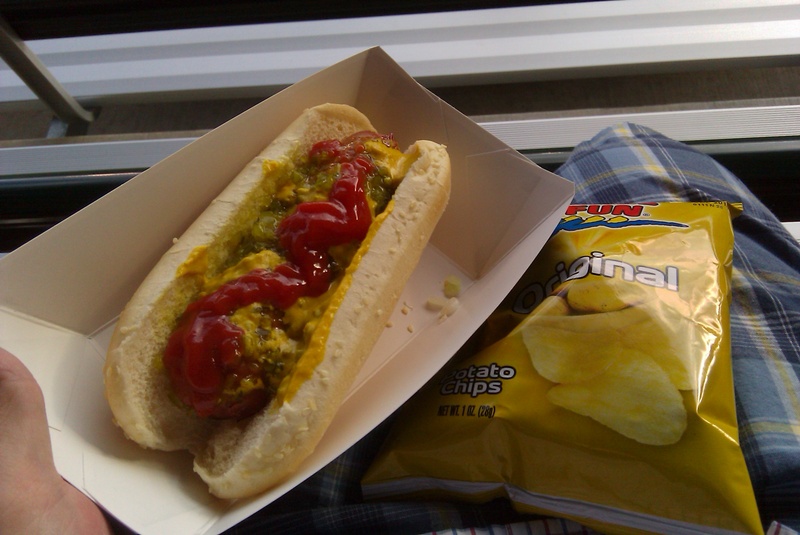 I went with the Twins big dog and chips ($5.25). I think its a quarter pound beef hot dog and it comes with a bag of chips. Its not a bad deal really, but the next time I go back, I’m getting the regular Twins dog, as it comes with chili and cheese for only $3.75. 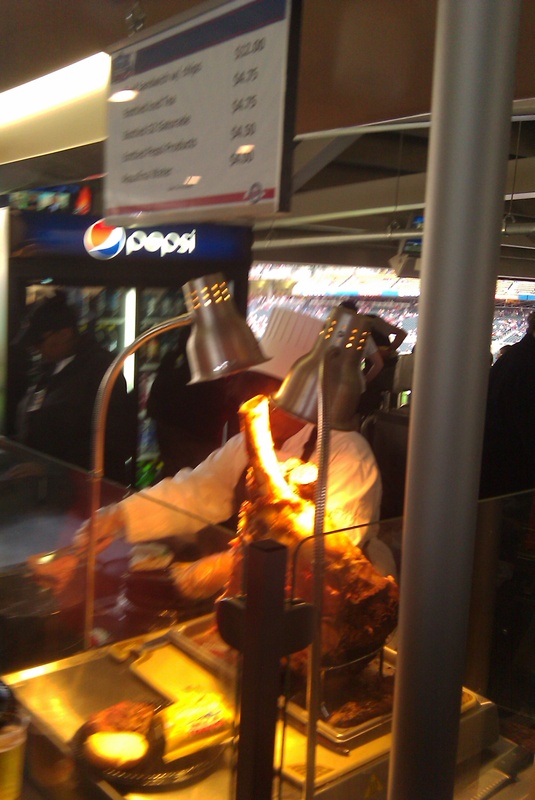 The new ballpark also features vendors that sell all sorts of different items, like this giant leg of beef where you can get a beef sandwich that is fresh shaved. There were also stir-fry places and nachos and walleye and pork chops on a stick. One of the draws that I went for – in preparation for the State Fair – were some cheese curds ($4.75). They are not cheap, but anytime you deep fry cheese, the results speak for themselves. 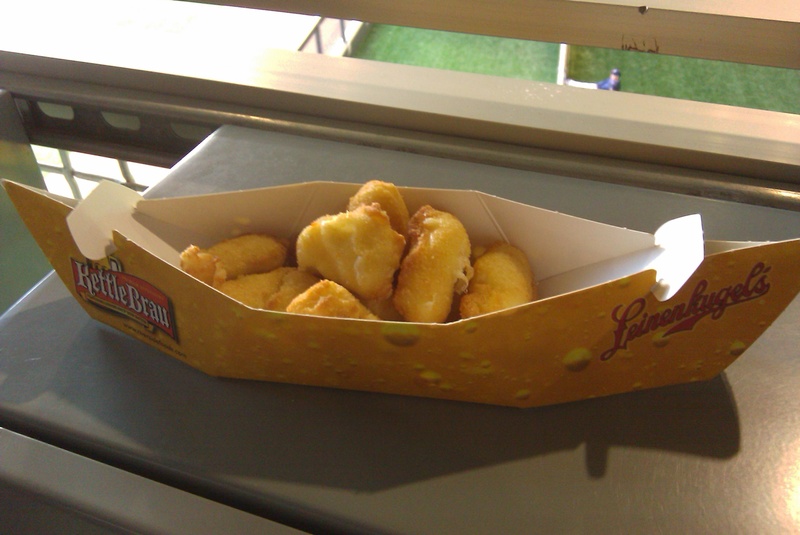 Plus, they come in this cute little Leinenkugel’s canoe. As always, beer is off the charts. 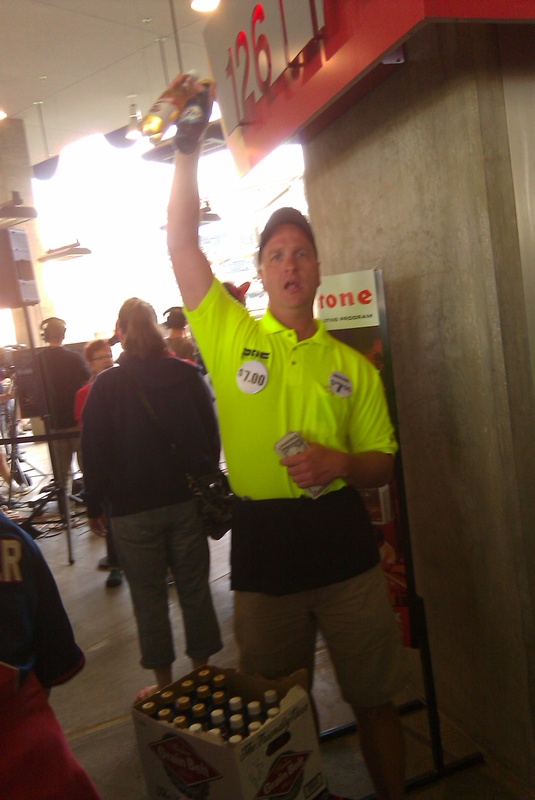 Here is one of the many vendors hawking his wares. Regardless of whether you want your beer in a cup or in the bottle, its going to cost you $7. However, the one thing that I did notice was that they did sell some local brews (like Summit and Leinenkugels) for $6.50. I don’t know about you, but I would take a 50 cent savings to get a better beer any day. 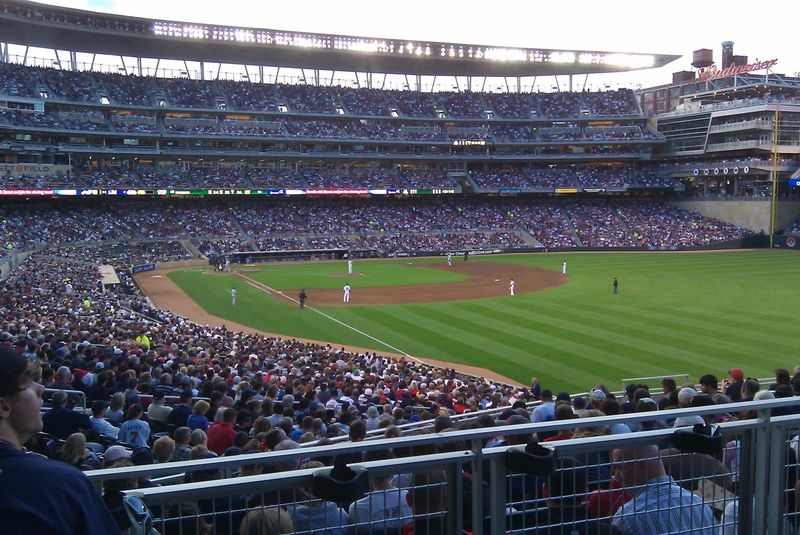 If you plan on getting your buzz on at the game, be prepared to spend some serious cash. Or, simply get a buzz before you come to the game, or invest in a handy flask, because they only search you if you have a bag on you; i.e. wear shorts with cargo pockets! 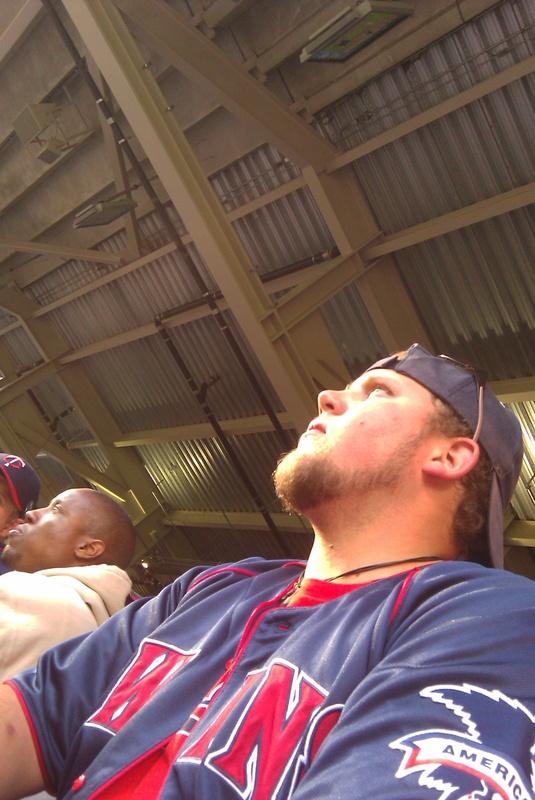 Lastly, this was the dude I was sitting next to. As usual, he was loud and berating for a bit but they quieted down. It was especially odd to hear him “lovingly” berate our own player in the outfield, until he hit a home run and was then very cordial to him. 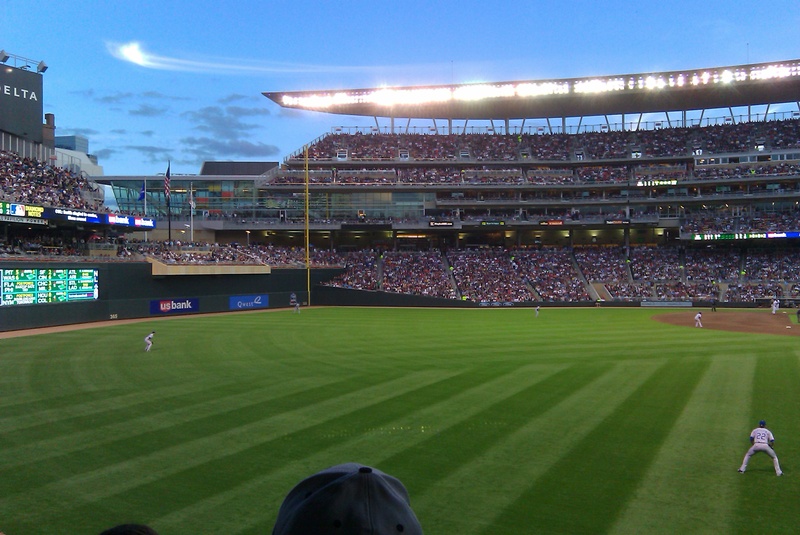 At the end of the night though, the Twins won the game 6-2 and it was a perfect end to a great game and a spectacular night for baseball. 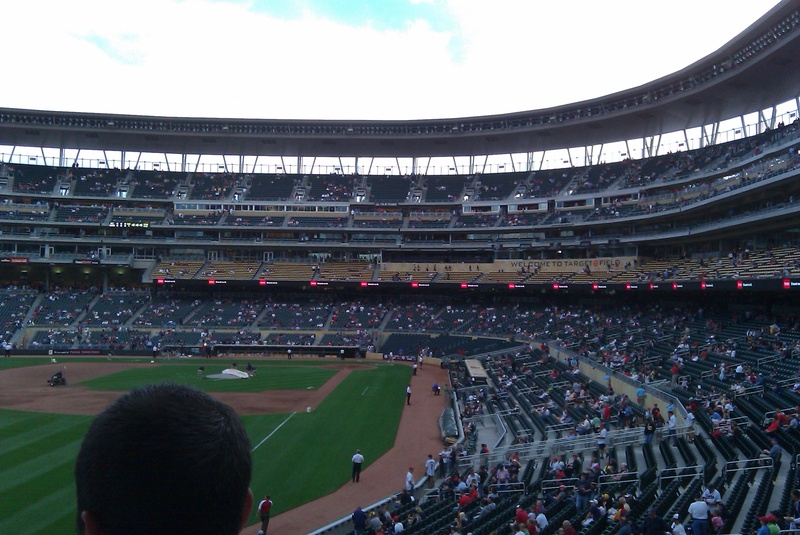 Are we going to get spoiled up here in Minnesota now that we have outdoor baseball? Well, we probably will, until September and October show up, then who knows.